*I wrote the first version of this editorial for The Wonky Press newsletter issue #10 and included related links for further reading. As the modern quilting world reflects on all that was just QuiltCon 2016 (featuring the largest annual modern quilt show in the world), I can't help but think about how we each develop our own styles. When I recently published a quilting close up of "Sunshine" on Instagram (below), a couple of people commented that they knew it was mine before even reading who posted it! I was both floored and humbled. I haven't *tried* to create my own style, but I have allowed myself to create without inhibitions. We are all influenced by the quilt designs around us. We see a pattern and say, "I want to make that!" It can be a useful exercise to think, "How can I make that pattern my own?" 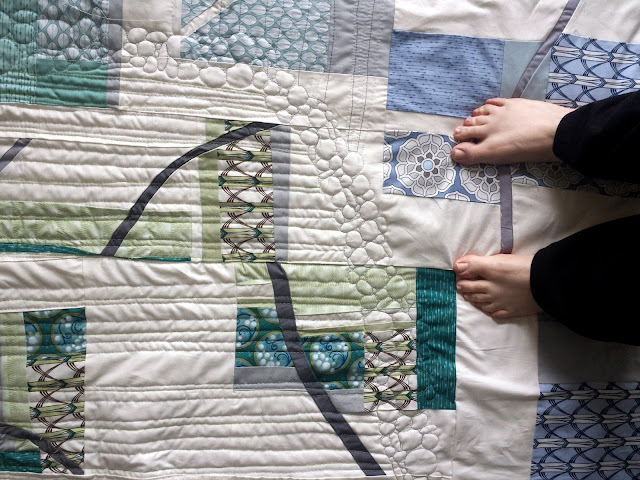 Then, the next thought comes tumbling out: "How can I find my own rhythm among all that I take in on a daily basis from blogs, Instagram, and other quilters?" That is really only an answer you can find yourself. Some of my designs certainly fall within the realm of the Modern Quilt Guild's definition of modern quilting, but not all. I won't get into the Modern Quilt Guild show every year (or maybe even ever again!) and that's okay. I have my own style of modern quilting. I'm following my own path. We don't have to fit into a definition. We don't have to make quilts for a specific show (of course, you should go for it if you want to, though!). Whatever you want to make, please, just GO MAKE THAT THING and let your creativity flow. In the immediate aftermath of QuiltCon, I find myself itching to make a quilt in reaction to what I saw literally quilting-wise. Whether it gets in one day or not, I’m still going to make it and OWN IT! To me, originality is following your own way. Individuality is making it your own in a crowd. There's a lot more room for both of these out there. Let's go for it! No pressure necessary. In the end, it's your quilt, after all. Make it your own. There will never be another quilt quite like yours, and that's something to be celebrated! YES! I'm seriously overflowing with inspiration from QuiltCon, and suddenly November 30th seems too close to get all my ideas made. But I am definitely planning some awesome quilts this year and will enter them to QuiltCon and other shows! Here's to making ALL the things! Making is so important and some people to get weighed down in "is it modern?" "is it good enough?" "will people like it?" Don't get bogged down in trivial concerns. MAKE! MAKE! MAKE! Kimberly - those last three words hit the nail on the head! I know it's hard not to compare ourselves to others and want to emulate them but we have so much creativity in ourselves! As they say "there ain't no special place in Heaven for awesome people." Oh, they don't say that? I like this quilt with the petals and I want to make one some day. We love it when we get acknowledgement from those people that we love, our family peeps. My girls - they think I am amazing. That makes me happy. I always tell them they are more amazing than me bc they are. I agree. It is hard after seeing so many pictures posted about QuiltCon and it is easy to get overwhelmed and feel what you are doing is not good enough or would never be good enough for that show etc. I chose to work on some improv things I started and that has kept me from doubting myself and to just sew. Featured in Machine Quilting Unlimited! Welcome, Fat Quarter Shop + Giveaway!